Download "Birkbeck, University of London. Common Awards Scheme. Regulations for Taught Programmes of Study 2013/14"
4 Regulations for Taught Programmes of Study 2013/14 3 Introduction and Scope of the Regulations (i) (ii) (iii) (iv) (v) (vi) (vii) These regulations relate to taught programmes of study for students, of Birkbeck, University of London (hereafter referred to as The College ). 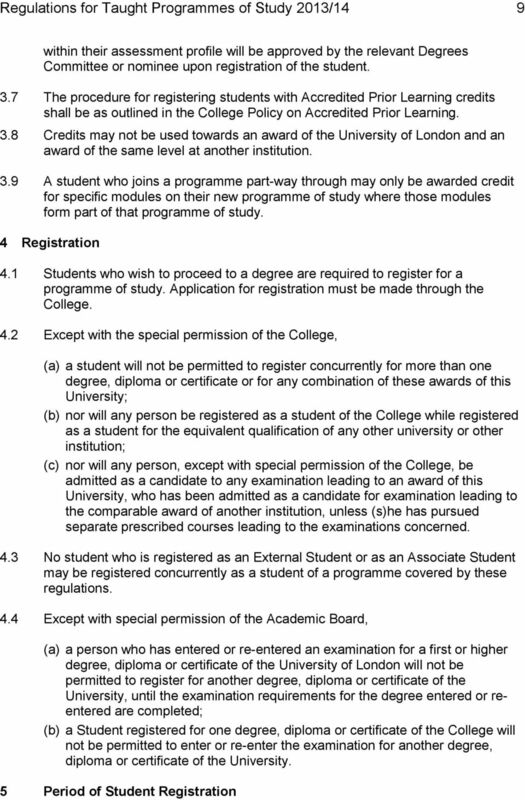 These regulations apply to all such programmes except for programmes of study operated from the College within the University of London external system, or where exemptions (either to specific regulations or to the regulations as a whole) are approved by the Academic Board of the College. 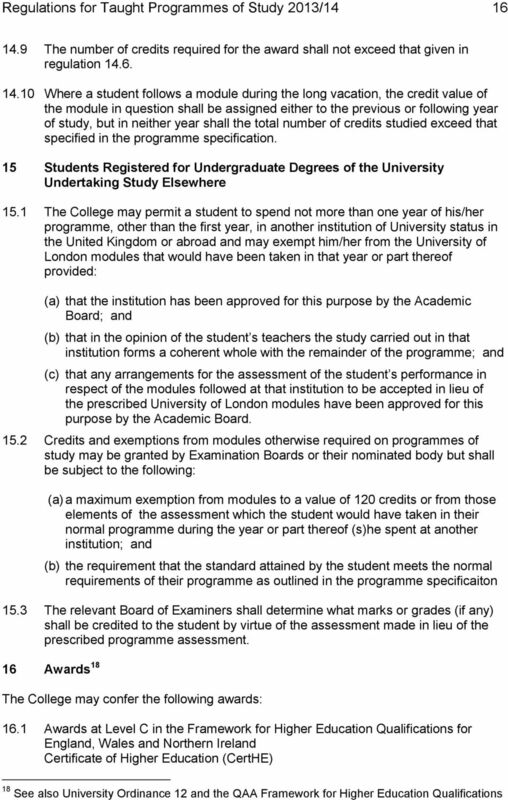 These regulations may also apply to individual programmes of study operated from the College within the University of London external system subject to the approval of the Academic Board (see also (vii)). This document should be read in conjunction with the Ordinances of the University of London, the current edition of the College Calendar and the appropriate programme handbook and programme regulations and other supporting documentation published by the College. 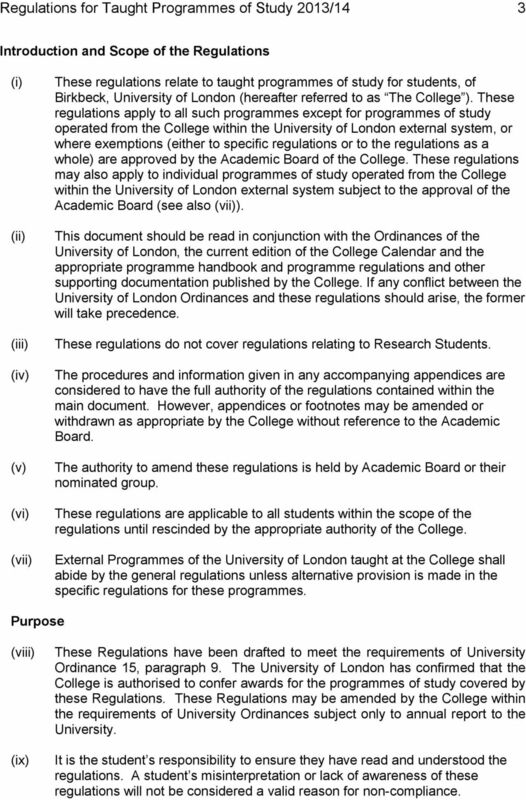 If any conflict between the University of London Ordinances and these regulations should arise, the former will take precedence. These regulations do not cover regulations relating to Research Students. The procedures and information given in any accompanying appendices are considered to have the full authority of the regulations contained within the main document. However, appendices or footnotes may be amended or withdrawn as appropriate by the College without reference to the Academic Board. The authority to amend these regulations is held by Academic Board or their nominated group. These regulations are applicable to all students within the scope of the regulations until rescinded by the appropriate authority of the College. External Programmes of the University of London taught at the College shall abide by the general regulations unless alternative provision is made in the specific regulations for these programmes. Purpose (viii) (ix) These Regulations have been drafted to meet the requirements of University Ordinance 15, paragraph 9. The University of London has confirmed that the College is authorised to confer awards for the programmes of study covered by these Regulations. These Regulations may be amended by the College within the requirements of University Ordinances subject only to annual report to the University. It is the student s responsibility to ensure they have read and understood the regulations. A student s misinterpretation or lack of awareness of these regulations will not be considered a valid reason for non-compliance. 5 Regulations for Taught Programmes of Study 2013/14 4 Scope of the Regulations (x) (xi) These regulations apply to the following degrees and to students registered at Birkbeck College for these degrees: FdA, FdSc (hereafter called foundation degrees) BA, BSc, BSc (Econ), LLB, DipHE, CertHE, CertCE (hereafter called undergraduate degrees) MA, MFA, MSc, MRes, LLM, PGDip, PG Cert, Graduate Diploma, Graduate Certificate (hereafter called postgraduate degrees) The examination regulations apply to all examinations for programmes covered by these regulations. Application of the Regulations (xii) These Regulations will apply to both new and continuing students. 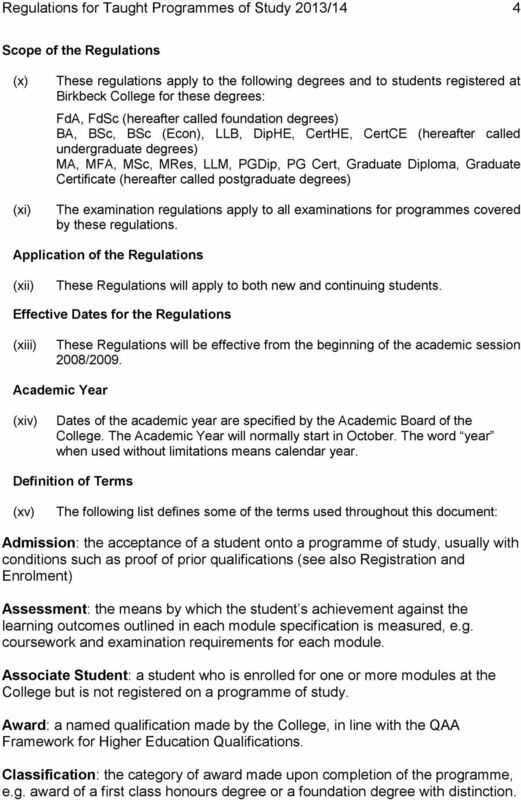 Effective Dates for the Regulations (xiii) These Regulations will be effective from the beginning of the academic session 2008/2009. Academic Year (xiv) Dates of the academic year are specified by the Academic Board of the College. The Academic Year will normally start in October. The word year when used without limitations means calendar year. Definition of Terms (xv) The following list defines some of the terms used throughout this document: Admission: the acceptance of a student onto a programme of study, usually with conditions such as proof of prior qualifications (see also Registration and Enrolment) Assessment: the means by which the student s achievement against the learning outcomes outlined in each module specification is measured, e.g. coursework and examination requirements for each module. Associate Student: a student who is enrolled for one or more modules at the College but is not registered on a programme of study. 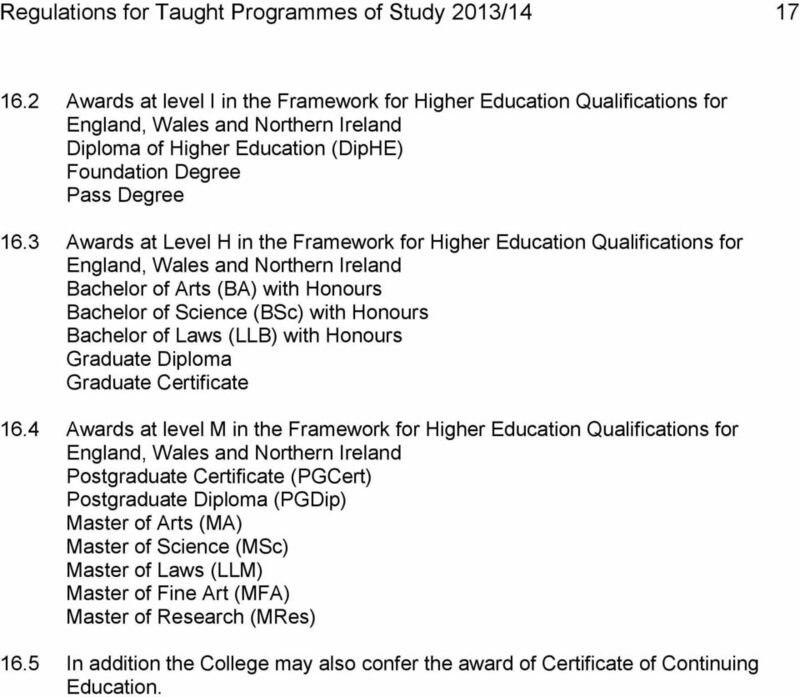 Award: a named qualification made by the College, in line with the QAA Framework for Higher Education Qualifications. Classification: the category of award made upon completion of the programme, e.g. award of a first class honours degree or a foundation degree with distinction. 6 Regulations for Taught Programmes of Study 2013/14 5 College: Reference to the College should be taken to refer to Birkbeck, University of London Coursework: coursework can consist of essays, assignments, in-class tests, laboratory tests, projects, dissertations, practical work, presentations, placement or field trip reports, designs, theses, artefacts, digital photographic media, and computer based analysis. This is not an exhaustive list. Credit: According to Academic Credit in Higher Education in England published by Universities UK, GuildHE and the QAA, Credit is used in HE to summarise and describe an amount of learning; it can help to identify 'how much' learning was involved and 'how hard' it was. 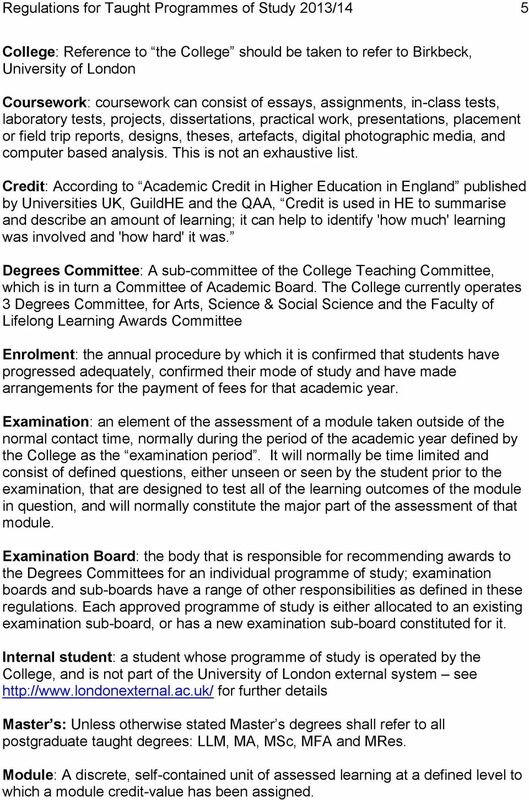 Degrees Committee: A sub-committee of the College Teaching Committee, which is in turn a Committee of Academic Board. 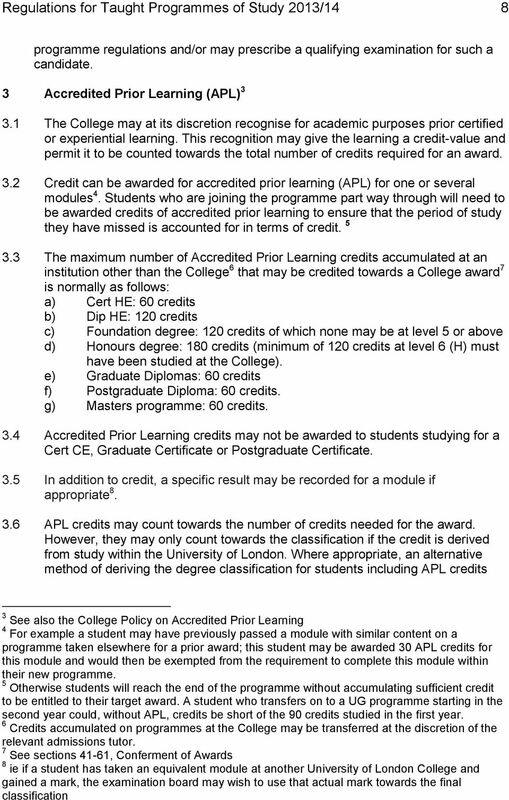 The College currently operates 3 Degrees Committee, for Arts, Science & Social Science and the Faculty of Lifelong Learning Awards Committee Enrolment: the annual procedure by which it is confirmed that students have progressed adequately, confirmed their mode of study and have made arrangements for the payment of fees for that academic year. Examination: an element of the assessment of a module taken outside of the normal contact time, normally during the period of the academic year defined by the College as the examination period. It will normally be time limited and consist of defined questions, either unseen or seen by the student prior to the examination, that are designed to test all of the learning outcomes of the module in question, and will normally constitute the major part of the assessment of that module. 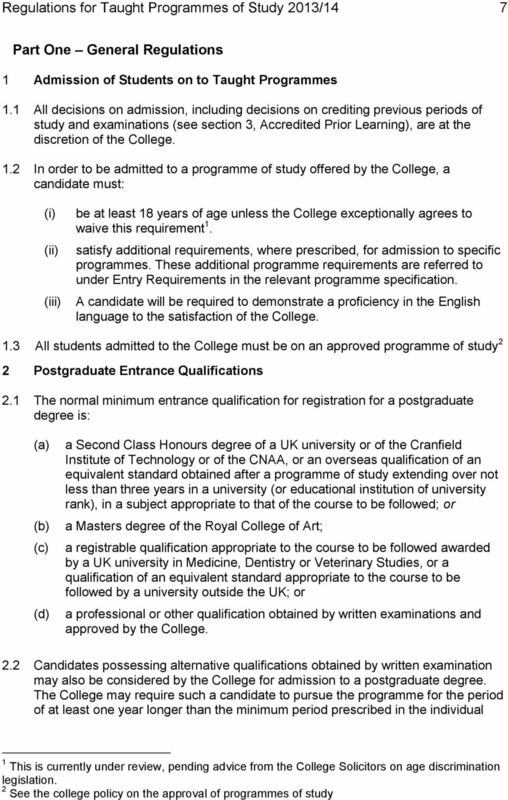 Examination Board: the body that is responsible for recommending awards to the Degrees Committees for an individual programme of study; examination boards and sub-boards have a range of other responsibilities as defined in these regulations. Each approved programme of study is either allocated to an existing examination sub-board, or has a new examination sub-board constituted for it. Internal student: a student whose programme of study is operated by the College, and is not part of the University of London external system see for further details Master s: Unless otherwise stated Master s degrees shall refer to all postgraduate taught degrees: LLM, MA, MSc, MFA and MRes. Module: A discrete, self-contained unit of assessed learning at a defined level to which a module credit-value has been assigned. 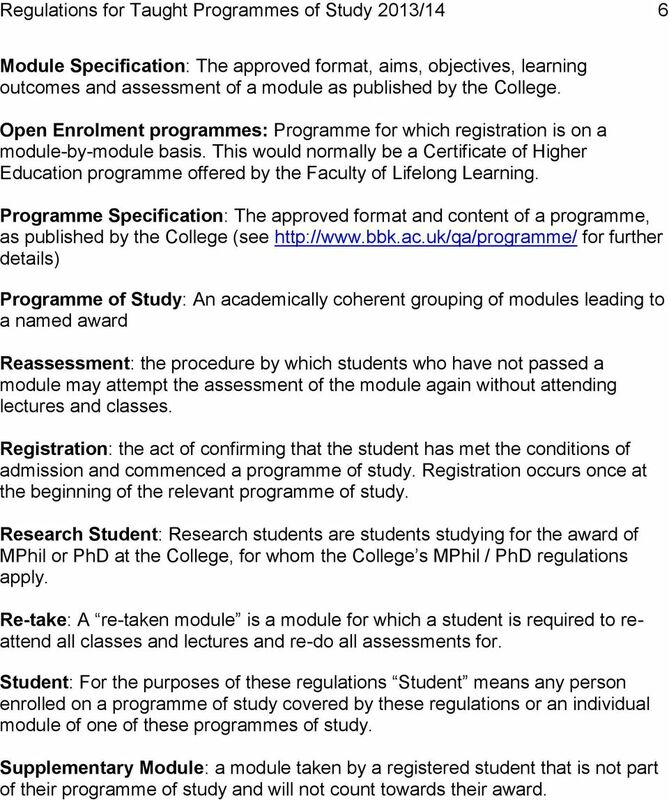 7 Regulations for Taught Programmes of Study 2013/14 6 Module Specification: The approved format, aims, objectives, learning outcomes and assessment of a module as published by the College. Open Enrolment programmes: Programme for which registration is on a module-by-module basis. This would normally be a Certificate of Higher Education programme offered by the Faculty of Lifelong Learning. 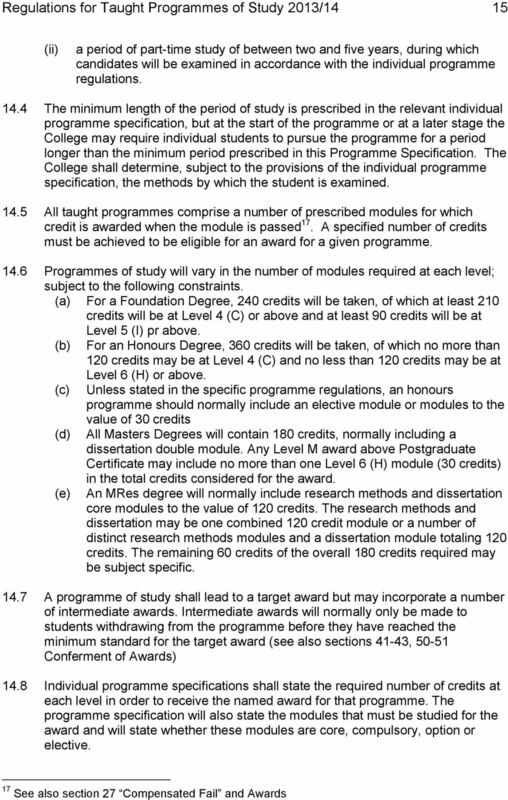 Programme Specification: The approved format and content of a programme, as published by the College (see for further details) Programme of Study: An academically coherent grouping of modules leading to a named award Reassessment: the procedure by which students who have not passed a module may attempt the assessment of the module again without attending lectures and classes. Registration: the act of confirming that the student has met the conditions of admission and commenced a programme of study. Registration occurs once at the beginning of the relevant programme of study. Research Student: Research students are students studying for the award of MPhil or PhD at the College, for whom the College s MPhil / PhD regulations apply. Re-take: A re-taken module is a module for which a student is required to reattend all classes and lectures and re-do all assessments for. Student: For the purposes of these regulations Student means any person enrolled on a programme of study covered by these regulations or an individual module of one of these programmes of study. Supplementary Module: a module taken by a registered student that is not part of their programme of study and will not count towards their award. 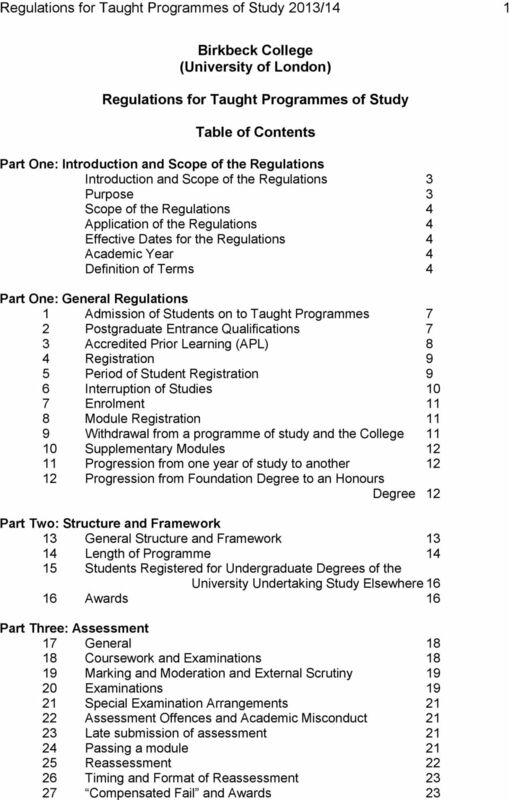 14 Regulations for Taught Programmes of Study 2013/14 13 Part Two Structure and Framework 13 General Structure and Framework Programme and module specific requirements shall be as outlined in the appropriate programme and module specifications. Programme and Module specifications may not be altered for the current academic session once teaching of the relevant programme / module has commenced unless all students have been consulted and none has indicated an objection All modules must be assigned a credit value. Modules may only be offered in half (15 credits), single (30 credits), double sizes (60 credits) or exceptionally quadruple sizes 16 (120 credits). No other size of module will be permitted. 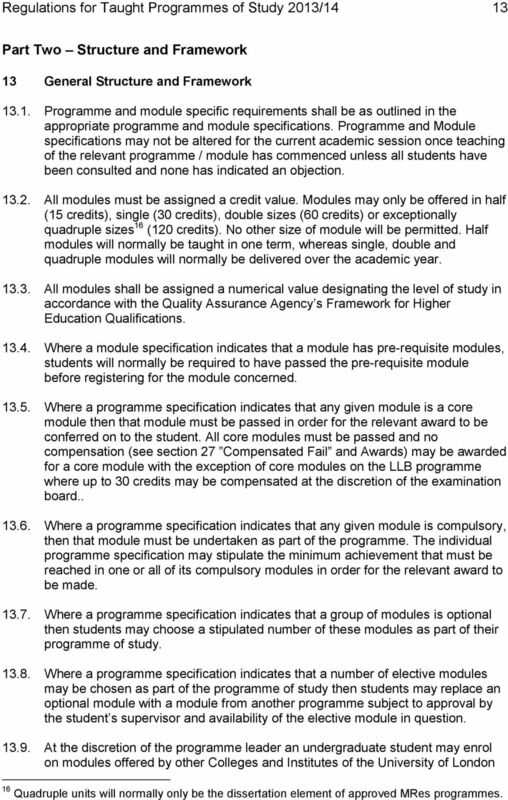 Half modules will normally be taught in one term, whereas single, double and quadruple modules will normally be delivered over the academic year All modules shall be assigned a numerical value designating the level of study in accordance with the Quality Assurance Agency s Framework for Higher Education Qualifications Where a module specification indicates that a module has pre-requisite modules, students will normally be required to have passed the pre-requisite module before registering for the module concerned Where a programme specification indicates that any given module is a core module then that module must be passed in order for the relevant award to be conferred on to the student. 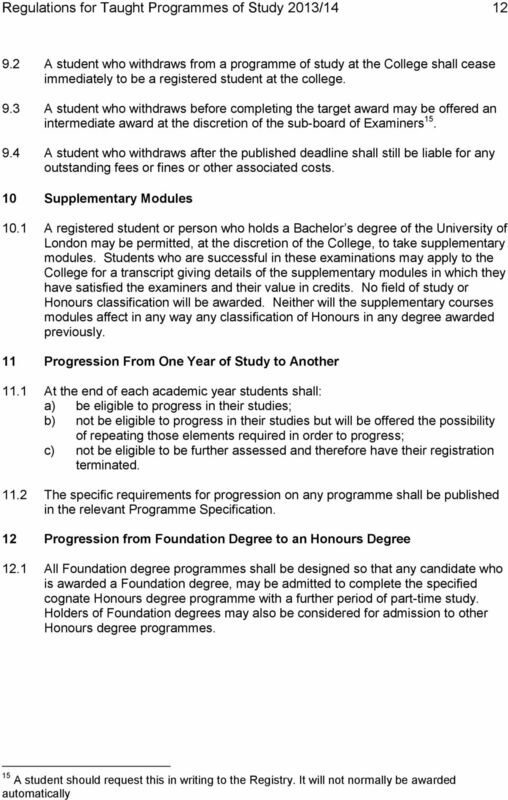 All core modules must be passed and no compensation (see section 27 Compensated Fail and Awards) may be awarded for a core module with the exception of core modules on the LLB programme where up to 30 credits may be compensated at the discretion of the examination board Where a programme specification indicates that any given module is compulsory, then that module must be undertaken as part of the programme. 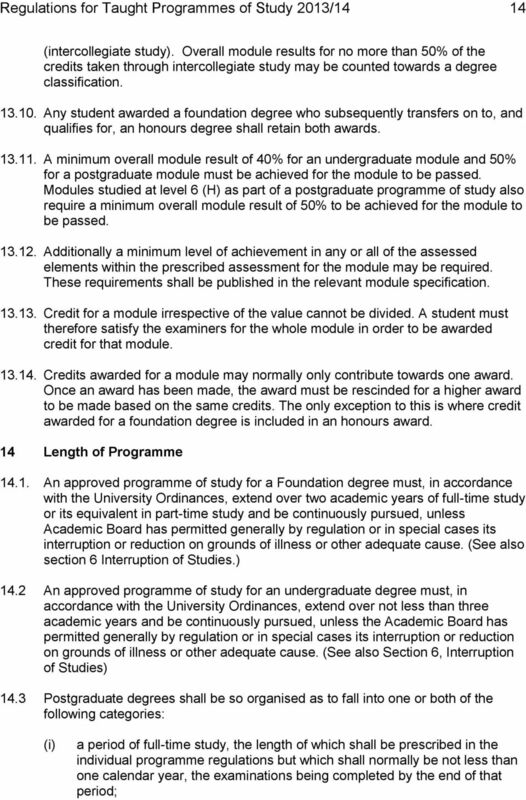 The individual programme specification may stipulate the minimum achievement that must be reached in one or all of its compulsory modules in order for the relevant award to be made Where a programme specification indicates that a group of modules is optional then students may choose a stipulated number of these modules as part of their programme of study Where a programme specification indicates that a number of elective modules may be chosen as part of the programme of study then students may replace an optional module with a module from another programme subject to approval by the student s supervisor and availability of the elective module in question At the discretion of the programme leader an undergraduate student may enrol on modules offered by other Colleges and Institutes of the University of London 16 Quadruple units will normally only be the dissertation element of approved MRes programmes. 18 Regulations for Taught Programmes of Study 2013/ Awards at level I in the Framework for Higher Education Qualifications for England, Wales and Northern Ireland Diploma of Higher Education (DipHE) Foundation Degree Pass Degree 16.3 Awards at Level H in the Framework for Higher Education Qualifications for England, Wales and Northern Ireland Bachelor of Arts (BA) with Honours Bachelor of Science (BSc) with Honours Bachelor of Laws (LLB) with Honours Graduate Diploma Graduate Certificate 16.4 Awards at level M in the Framework for Higher Education Qualifications for England, Wales and Northern Ireland Postgraduate Certificate (PGCert) Postgraduate Diploma (PGDip) Master of Arts (MA) Master of Science (MSc) Master of Laws (LLM) Master of Fine Art (MFA) Master of Research (MRes) 16.5 In addition the College may also confer the award of Certificate of Continuing Education. 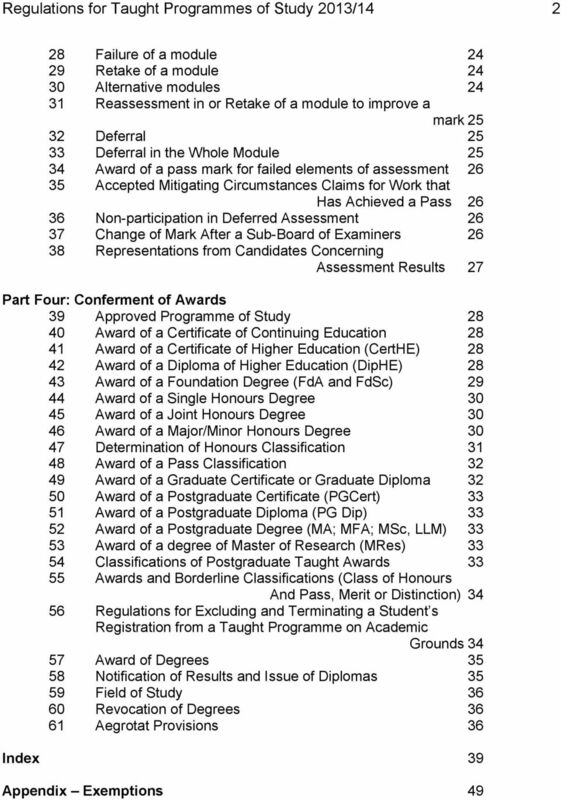 20 Regulations for Taught Programmes of Study 2013/14 19 the individual assessment. A mark of 0 will be normally recorded for that element in these circumstances Students must, at the request of the College submit their work to any Collegeapproved plagiarism detection service. A deadline for this submission may also be set by the relevant School. 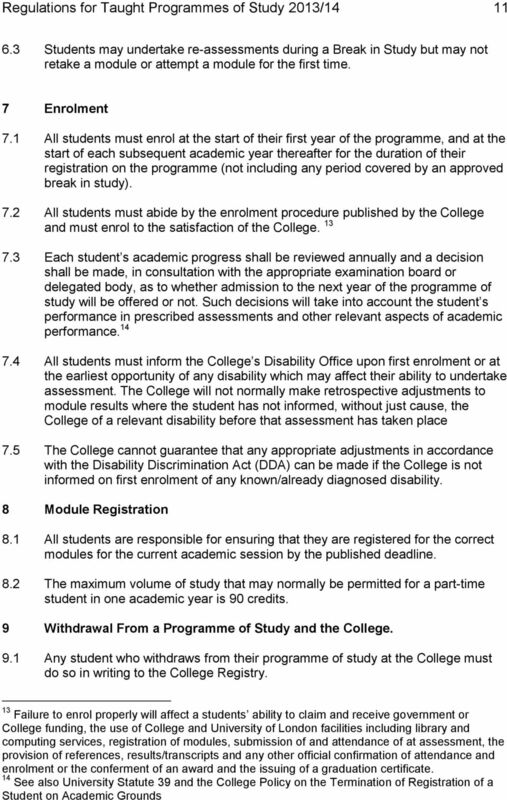 Failure to comply with any such request, or failure to meet the relevant deadline, will constitute an assessment offence and will be dealt with according to the College Policy on Assessment Offences. 19 Marking and Moderation and External Scrutiny: 19.1 The marking and moderation of all assessment shall be governed by College policies on marking and moderation, on assessment board practice and the roles of examiners The selection, appointment, and role of Visiting Examiners shall be governed by the College s policies on the appointment of boards and committees of examiners. 20 Examinations 20.1 At any examination in which there is a practical examination in any experimental science subject, a candidate must satisfy the examiners in both the practical and written parts of the examination All answers to examination questions must be written in English unless instructions are given to the contrary Candidates must not remove any examination script(s) (whether completed or not) from an examination room Candidates at any examination by written papers taken under supervision and within a defined time limit or at any practical, oral or similar examination are permitted to use only such books, notes, instruments or other materials or aids as are specifically permitted by the appropriate authority for the examination in question. No stationery is permitted in examinations other than approved examination stationery, which should be used for any rough notes and then crossed through where such notes are not to be submitted for assessment Where candidates are permitted to use their own electronic calculators at examinations, the machine to be used must be of the hand-held type, quiet in operation and compact, and must have its own power supply. Candidates are entirely responsible for ensuring that their machines are in working order for their examinations and for providing in advance for alternative means of calculating in the event of the calculator failing during the examination. When candidates use electronic calculators at examinations they must state clearly on their 22 It is the student s responsibility to ensure that work is submitted by the published deadlines and in accordance with the published system. Students must check with the Module Director and/or School in advance of the deadline if they are unsure of the correct procedure for submission of work. 21 Regulations for Taught Programmes of Study 2013/14 20 examination scripts the name and type of machine use. The unauthorised use of material stored in a pre-programmable memory will constitute an assessment offence Except as provided in regulation 20.4 above, no books, notes, instruments or other materials or aids whatsoever may be introduced into an examination room or be handled or consulted during an examination. Any such materials or aids in the possession of the candidate on entry to the examination room must be deposited immediately with the Invigilator Any unauthorised materials or aids introduced by a candidate into an examination room must upon request be surrendered to the Invigilator. Any aids so surrendered may be handed over by the Invigilator to the College which may make copies thereof, and the original aids (together with all such copies) may be retained by the College at its absolute discretion Candidates shall not, unless expressly so authorised, pass any information from one to another during an examination nor shall any candidate act in collusion with another candidate or other person or copy from another candidate or engage in any similar activity At any examination by written papers taken under supervision or where the regulations for any qualification provide for part of an examination to consist of take-away papers, essays or other work written in a candidate s own time, coursework assessment or any similar form of test the work submitted by the candidate must be his/her own and any quotation from the published or unpublished works of other persons must be duly acknowledged Candidates shall not obtain, or attempt to obtain, access to examination papers prior to the start of the examination, unless expressly authorized to do so Candidates shall not copy, or attempt to copy, the work of another candidate during an examination, whether by looking at what they have written or are writing, or by asking them for information, in whatever form Candidates may not attempt to tamper with examination scripts or coursework after they have been relinquished Candidates may not attempt to add to or amend examination scripts after they have been instructed to cease writing during or at the end of an examination Failure to observe any of the provisions of paragraphs above will constitute an assessment offence. 22 Regulations for Taught Programmes of Study 2013/ Special Examination Arrangements 21.1 At the discretion of the College appropriate alternative arrangements (hereafter referred to as Special Arrangements) may be made for a candidate who is severely ill or otherwise disabled, to take his/her examination The procedure for applying for Special Examination Arrangements and for their approval is defined in the College s Policy on Special Examination Arrangements Students who request Special Arrangements, but who do not attend the examination are liable for any academic penalty that may be applied for nonattendance at or non-submission of assessment (see regulation 17.5) 22 Assessment Offences and Academic Misconduct 22.1 Candidates found to have committed an offence are subject to a range of penalties that may be imposed by the College, up to and including exclusion from all further examinations of, and termination of registration at, the College. The procedures for investigating suspected assessment offences including the penalties that may be awarded are detailed in College Policy on Assessment Offences which shall be considered to have the full force of the College s regulations. 23 Late Submission of Assessment Any piece of assessment that is submitted late and for which no application for consideration of mitigating circumstances has been accepted will be awarded a mark of no more than 40% (undergraduate modules) or no more than 50% (postgraduate modules). 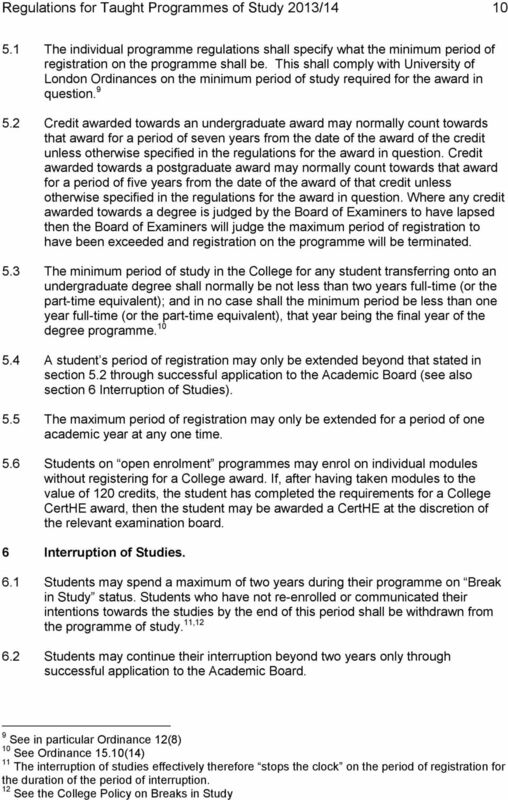 Where an application for consideration of mitigating circumstances is accepted, the relevant Board may, at its discretion, consider the work as if it had been submitted by the appropriate deadline Where an assessment has not been submitted or attended and no application for consideration of mitigating circumstances has been accepted (e.g. an examination) a mark of zero will be awarded. 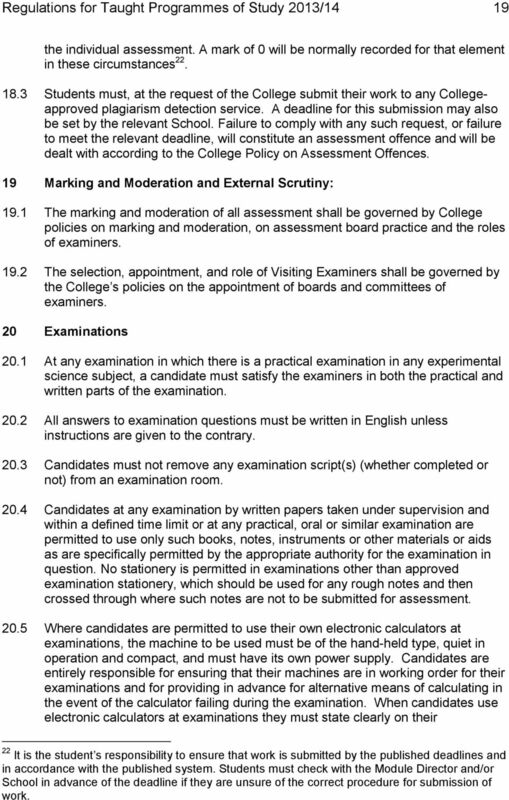 24 Passing a Module 24.1 If a student fails to achieve an overall pass in a module (as defined in the relevant module specification) the Board of Examiners or nominated committee may decide at its discretion (subject to regulations ) to allow the student to: 23 Applications for Special Examination Arrangements should be made to the College as early as possible after registration and must reach the Examinations Officer in the Registry no later than six weeks before the date of the candidate s first examinations test. Applications received after this date will only be considered for cases of sudden illness or accidental injury. 24 See also section 33, Deferral in the Whole Module, the College Policy on Mitigating Circumstances and the College Policy on Late Submission of Coursework. 23 Regulations for Taught Programmes of Study 2013/14 22 a) be reassessed in one or more of the elements of assessment for the module by a date the Board of Examiners or nominated committee will set (a student will not normally be reassessed in an element of the module in which they have already achieved a pass); or b) retake the entire module (i.e. re-attend all lectures and seminars AND reattempt all elements of the assessment) Re-assessment, as defined in regulation 24.1(a) may take the same format as the original assessment of the element in question, or may take an alternative format at the discretion of the relevant examination board At Undergraduate level, students will be offered three attempts at passing any element (other than where an assessment offences panel has decreed otherwise), including a maximum of one reassessment opportunity At postgraduate level, students will be offered two attempts at passing any element 25 (other than where an assessment offences panel has decreed otherwise). 25 Reassessment 25.1 The Board of Examiners or nominated committee has the final decision on whether to allow a student to be reassessed in any element of a module A student may be eligible for re-assessment in one or all of the elements of a module that they have not previously passed, at the discretion of the relevant Board of Examiners or nominated committee, subject to Regulations 24.3 and If a module contains more than one element of assessment, a student will not normally have to be reassessed in an element in which they have already achieved a pass Any student who is offered reassessment but who does not take up the offer will retain the fail mark originally recorded for the element and the overall module result Reassessment is not compulsory. 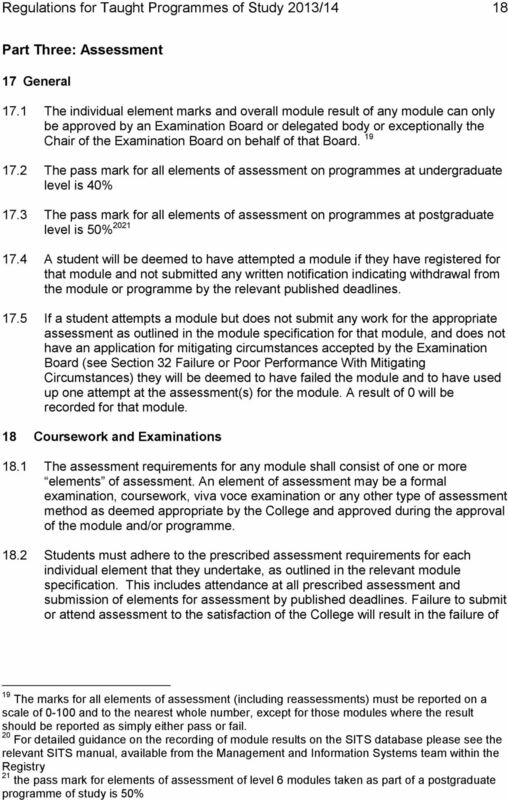 However, students who do not take up the offer of reassessment or fail the reassessment will be required to do one of the following: (a) retake the module (obligatory if the failed reassessment is part of a core module with the exception of core modules on the LLB programme where 25 If a student has exhausted all attempts at achieving a pass in a core module they would normally be excluded from the programme and College (see section 56, Regulations for Excluding and Terminating a Student s Registration from a Taught Programme on Academic Grounds). 26 Reassessment in one or all elements of a module does not normally involve re-registering for the module or attendance; neither does it involve payment of tuition fees except when the student is registered as Exam Only in which case the appropriate fee shall be levied. 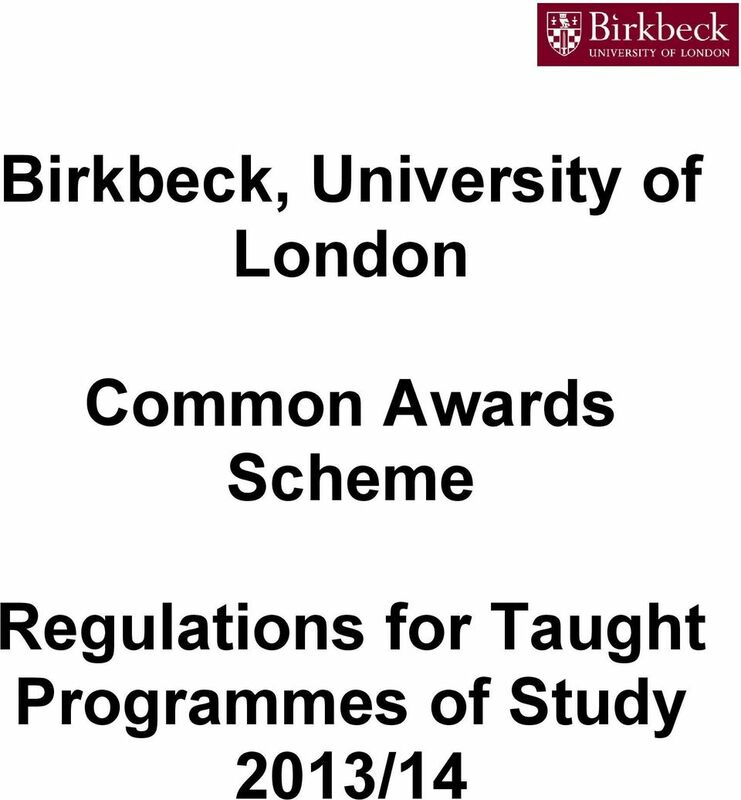 Birkbeck, University of London Common Awards Scheme Postgraduate Programmes Introduction 1. The majority of Birkbeck s postgraduate programmes are offered as part of the College s Common Awards Scheme.